As we strolled the Champs Elysees last night, we noticed the funny titles given to American movies. 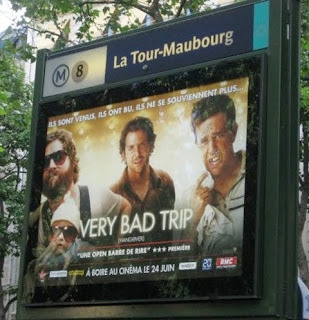 For example, the recent B-grade comedy Hangover was called Very Bad Trip (not sure why Hangover would have been misleading but apparently it doesn't convey drunkenness). 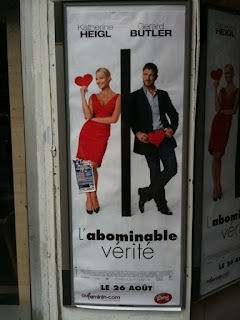 However, my favorite -- so far, I will post more as I find them -- was the French translation for The Ugly Truth, a hilarious comedy with Katherine Heigle and Gerard Butler (much, much better than the Hangover in my opinion which I saw only on the very bad advice I received from some friends). How about this translation? Abominable? There is a lot to be said for community translations, especially in areas where companies do not deem it necessary to localize for other markets (such as fansubs of Japanese anime etc.) or there simply isn't a company behind a product (open source software anyone?). But if you are running a business and trying to make the most out of the opportunities presnted by globalization, using professional translation services is the only way to go. Consumers these days are well informed and up to date with the things around them and brands have realized and acknowledged it. If you miss a movie and is now available on 123movies, you can also find these older movies. It can be fun to go back and watch movies of your favorite actors and actresses as well.